Today is Armistice Day, the day when the armistice was signed to bring the fighting of World War I to a halt. It is also a very special day in the U.S. Today is a day to remember and honor our troops--all who have served and all who serve now. Memorial Day in the spring is a sacred day, a time set apart to honor those who died in service to their country. It is right, of course, that we should devote a special day to that remembrance. 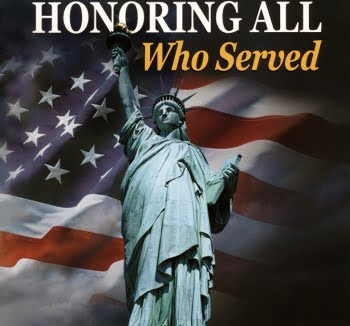 But Veterans Day is a day for honoring all who served. Each man or woman who has ever spent time in service to this country deserves to be thanked and honored. Each one has made sacrifices. We owe them all a debt of gratitude. Thank you, troops. God bless you all. And to the Lord who loves every member of those armed forces: we thank You and bless Your name, and we ask your protection on those now in harm's way. Great post! We talked about the history of Armistice Day/Veterans' Day in Bible study this morning. I am so thankful for all our brave service members, and especially for my family members who have served or are currently serving! Wonderful post! It's so very important to remember those that serve, have served & continue to serve for our nation's good. seems i'm all of out words today... this morning's post took all i had to give. but i do have a thank you left... love you!